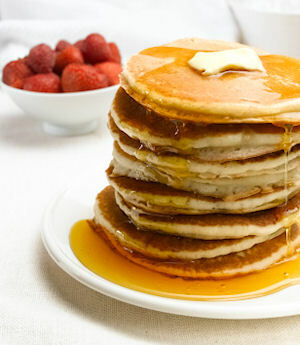 These creamy, savory and delicious pancakes are the perfect dish for unexpected guests. When you need to get breakfast on the table minutes, turn to this tried-and-true recipe for a delectable dish that will have everyone reaching for more. Serve topped with fresh berries, and pour a mimosa, for a perfect way to start the weekend. Whisk together pancake mix, skim milk, and ricotta until just smooth, adding more milk if necessary to achieve a creamy consistency.